TSIMANE BOLIVIA their grand plans. I told him that either Brian or I would to visit as soon as possible and in the meantime we would fidget like five-year-olds waiting for Christmas morning. In August of 2009 Brian was among the first to visit and from that point forward we were forever changed by what we consider to be possibly the most dynamic new fishery of the decade. 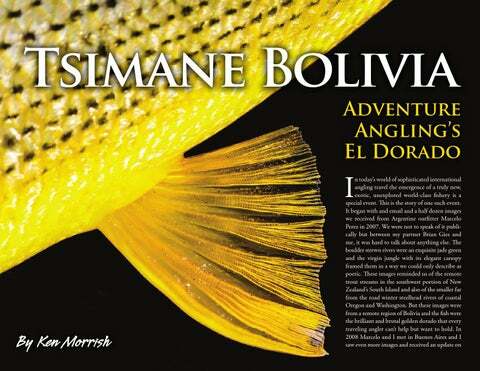 The golden dorado (Salminus brasiliensis) is without question one of the world’s greatest game fish. With massive powerful jaws, razor sharp teeth, vicious predatory instincts and wild aerial displays they represent one of the ultimate target species for the adventuresome fly angler. Indigenous to Brazil, Paraguay, Uruguay, Argentina and Bolivia they often hunt in packs chasing down their favorite baitfish the sabalo. They can grow to over 60 pounds and while most Mormons, Tribes and Traffickers are in the 10 to 25 pound class they are all too happy to attack baitfish in The story of how the Tsimane operation came together is almost a crazy as the six to eight pound class. While fishing dorado at Tsimane it is common hooking a 25-pound dorado on a short line. In the beginning there were just to hook a four or five pound fish only to have it attacked and in some cases the Tsimane and the Yuracaré people living simple hunting and fishing lives completely swallowed by a larger dorado. Sometimes you get half of your fish in a portion of Bolivia where the base of the Andes meets the lowlands and back, other times, just a shredded mess that looks like pasta with the rivers flow north into the Amazon. Then, in the 1980s, as the demand for red sauce. It is equally as common to observe aggressive dorado cocaine soared in the Northern Hemisphere, intrepid narco-traffickers trying to steal or eat the fly that is hanging out of the mouth of boldly made their way up a very special river to an ultra-remote the fish that you are fighting. Generally speaking they display Tsimane community. Once there they somehow enlisted very poor manners. the tribe to hack a primitive airstrip out of the jungle. Were one to take the best elements of a tarpon, a Once completed they landed planes loaded with raw coca A n d in o steelhead and something nasty, like a barracuda, spray paint leaves, and through a process of bathing the leaves in diesel, made raw Dec eiver it brilliant gold and highlight it with black pinstripes you would cocaine. They did this for many years but ultimately, through trackhave a golden dorado. Were you to put that fish in the most pristine jungle ing diesel purchases, the little lab in Tsimane territory was shut down by the environment imaginable, with untouched freestone rivers, massive log jams, authorities and the locals returned to life as normal. The only real difference incredible wildlife, countless bird species and kind fascinating native peoples, being that they now had a secret airstrip. In time an ambitious young Mormon you would have Tsimane. While the Tsimane systems have resident dorado missionary learned of this band living in the Asunta region and their airstrip year-round they also have a strong migratory population. Each season, typiand headed in for a visit. He liked the place and the people and saw it as an cally in late May and June, millions of baitfish migrate up the greater Secure opportunity. He must have also liked to fish because word spread of what he system and with them come thousands of large, aggressively feeding dorado. saw in the river; packs of big bright golden dorado mercilessly tearing through Here it is common to see packs of fierce dorado herding baitfish into the shalschools of unsuspecting baitfish. These rumors made it back to the Argentine lows and mercilessly ripping through them. From a great distance you can see dorado fishing intelligentsia and soon Marcelo Perez and his contemporaries the frothing commotion as the bait leaps into the air in a desperate effort to at Untamed Angling were on their way to making the Tsimane operation and escape. From a quarter mile away the raining down of sabalo sounds like a Bolivian fly fishing history. dump truck dropping 20 yards of gravel. When you find yourself in the midst Today the operation is a multifaceted collaborative effort that works closely of this carnage frantically casting a six inch fly into a fray of sharklike yellow with the Isiboro Secure Indian Territory and National Park, its tribal leaders fins and tails you will have arrived in the Tsimane Zone. and over 70 local families that help support this remarkable operation. To date, the Tsimane programs have had a number of configurations but moving forward there are two closely related yet distinct programs from which to choose. Both trips begin with an overnight in Santa Cruz followed by a two hour small aircraft charter flight to a remote jungle airstrip. The hardest part of planning the trip is deciding which of the two options to select as they are both highly desirable and productive. 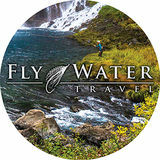 In both programs anglers access the rivers by boat. In some cases you will move about in large motorized dugouts and in other cases, you will use smaller traditional pole pushed dugouts captained by skilled native boatmen. Irrespective of the program both trips into the heart of the Bolivian jungle are best suited to adventuresome travelers who enjoy wade fishing and a fair amount of walking. fish the main Secure often casting at large woody debris from the boat. This combination trip is as good as it gets and a natural for parties of four keen on seeing a wide range of what the region has to offer. TSIMANE BOLIVIA parties), single accommodations, easier travel to reach the camps and fishing beats and easier wading. This program also offers a bit more fishing from the boat, access to the region’s smallest streams (not to be confused with small fish) and the best opportunity to engage with and experience the adjacent and endearing local communities. Pluma Lodge caters to eight anglers making it a more social camp and their double occupancy cabins are slightly more spacious. Pluma anglers also enjoy an exciting jeep ride into camp complete with mud bogs and stream crossings adding to the overall sense of jungle adventure. Much of Pluma’s water is characterized by rocky freestone terrain making it rather physical and best suited to strong waders. The benefits include a really wide range of water types ranging from pocket water to long pools and runs and arguably the best sight fishing opportunities. The other great feature is the ability to partake in either of the upriver out-camps for multiple nights and become fully immersed in a stunningly beautiful deep jungle experience. For anglers that prefer only unpacking once and staying put for full week, Pluma also offers that option and it continues to be the most common approach, as all out camp overnights are voluntary. wire attached with an Albright knot and you are set for 90 percent of the fishing situations that you will encounter. When it comes to flies, the favored bets tend to be four to six inches long and tied on 3/0 hooks. The most common designs are based on the Andino deceiver which is like a standard deceiver with the addition of lead eyes and a spun deer hair head. Black patterns or black with a wide range of highlight colors account for most of the fish landed. In low or especially clear water moving towards lighter landing pattern like Puglisi baitfish patterns tied to 30-pound wire can also prove advantageous. Additionally large poppers and patterns like the titanic slider can provide explosive top water action. In most instances anglers will cast slightly downstream and across and retrieve the fly with fairly brisk two foot strips. In other instances, especially on the lower main stem Secure, where the water tends to be more colored your guide might prefer a standard slow steelhead swing and in clear pocket water scenarios you might actually fish up and across and let the fly dead drift toward your target. In many of the best top water situations you might fish your fly square to the current and strip it as fast as you possibly can. I will never forget one of my first top water experiences on the upper Secure not far downstream of Asunta. My guide walked me up into what appeared to be an impossibly fast shelf of water between two rapids. I was skeptical and began wading into position well above the shelf in order to slow my presentation. He stopped me and said “no, fish it straight across and strip as fast as you can.” I honestly thought he was crazy, but I did as instructed and on my third cast a huge fish came charging at the fly with half its body out of the water snapping wildly at my popper until it finally caught and crushed it. All totaled, there are few if any tips that I get more excited about than Tsimane. With great guides, accommodations, natural beauty and wildlife as well as the high likelihood of tangling with multiple fish in the ten plus pound range every day, I see this a true must see destination for all serious adventure anglers.